Let me start this post off with the usual and necessary disclaimer. The views expressed in this post / article are simply my opinion and are for informational purposes only. This article / post is in no way meant to represent or be taken as investment advice. You must always do your own due diligence in the form of your own research and obtaining your own financial / legal advice before making any investment decisions. Normally I write about and discuss the Forex Currency markets but I have been taking a close look at the fascinating world of cryto-currencies as of late. I wanted to take this opportunity to write a piece about, what I believe to be a very promising block-chain technology project called Publica (PBL). With a litany of new ICOs and new crypto-currency coming out each and every week it is getting more and more difficult to find those “hidden gems” which appear to have great short term and long term potential. Having said that the block-chain technology revolution that is upon us is still in its infancy. Those alive and breathing right now and aware to this unique situation in history can truly profit by putting in the necessary work and having a little patience. Publica aims to utilize the block-chain (smart contract) technology to decentralize the e-book publishing market. Publica aims to significantly reduce the entry barrier for up and coming e-book authors in a number of unique ways while at the same time providing incentives for e-book purchasers to utilize the technology and support these authors. The Publica Website can be found here: https://publica.io/ Below I have outlined the top three (3) reasons why I believe Publica will be a major disruptor in 2018 and the years to come and will have massive growth in value. Personally when I am researching or looking at a particular crypto-currency, one of the first questions I ask myself is; “What real world problem does this actually solve and why should I care?” I believe this first question alone will filter out many of the “new” concurrency technologies which claim to be the next “Bitcoin”, “Ethereum”, etc. a) Uniting authors and readers directly, cutting out the “middle man” retailers which will result in greater revenues for the actual authors and increased savings passed on to the readers. b) Expanding the range of business models available to the authors, and allowing for the authors to potentially raise the funds necessary to produce the literary works. c) Greater creative and business freedom to the authors who can in turn provide greater options to the readers. d) Unique ownership rights of the purchaser of the e-book resting with the purchaser through the READ tokens. e) Print on demand capabilities to allow paper back copies for those who prefer that format and eliminates the waste associated with traditional large print runs. In 2017 the e-book industry is reported to have sales in the range of $11.354 billion. (https://www.statista.com/outlook/213/100/ebook/worldwide#). As more and more people are discovering the world of e-books and all of benefits that utilizing this form of content has to offer, the volume of this market place will only continue to grow. Even if one conservatively assumes Publica only captures a small portion of this market volume, the room for Publica’s growth is still staggering. At the time of this writing CoinMarketCap.com reports that Publica has a very modest market capitalization of approximately $15 million dollars. The current market cap of Publica is minuscule, both in terms of the 600 billion market cap held by all crypto-currencies at the moment, and in terms of the annual volume of e-book sales world wide. Publica tokens, namely Pebbles (PBL) will be relatively scarce as there will be a max supply of 33,787,150 of the PBL tokens CoinMarketCap.Com . At the time of writing the PBL token has a value of $1.06 To put this into perspective, assuming Publica cracks even the top 30 in terms of crypto-currency market cap, reaching approximately 1.3 billion in market cap, it could potentially have a token value of approximately $70.00 or approximately 65 times (65x) its current token value at the time of this article. In a sense a new blockchain technology is only as good as the team behind it. The project may have many brilliant ideas, but without the strong leadership, and the dedication to follow through, a project will be at risk of petering out and failing to materialize. The team is made up of CEO Josef Marc, COO Antons Sapriko, and CTO Yuri Pimenov. Josef Marc leads the Publica team. As outlined on the Publica website, Josef Marc has been involved with some very important media projects such as DirecTV and Verizon FIOS TV and the experience gained on those projects has prepared him for his work ahead with Publica. As outlined on the Publica website, COO Antons Sapriko is responsible for operational management at Scandiweb. Based on their website, Scandiweb is a long established (2003) company providing e-commerce solutions for companies such as Coca-Cola, Walmart, Jaguar, Sephora, and Thomson Reuters. CTO Yuri Pimenov is described as a pioneer in Bitcoin trading technology and systems, and prior to joining Publica was the CTO of a leading Bitcoin exchange. The Publica website also outlines its clear road map for 2018 which includes having the PBL token being operational by December. Again this article is by no means investing advice but if you are interested in finding promising block-chain technology projects you will definitely want to take a close look at Publica. Hello all happy Sunday to you. For those of you staying on top of the forex markets recently you will know that most of the Jpy forex pairs have been trending long very nicely. Below is a video recorded today (Sunday December 4, 2016) with a brief analysis of how I personally traded the EurJpy over the past two weeks or so. Hopefully this video will give you some good ideas if you are interested in trend trading, especially using the higher time frame charts such as the four hour or daily. Hello all I am sure what is on your mind this week is obviously the U.S. presidential election and how to possibly take advantage of the increased volatility in your forex trading. A very quick post today regarding my thoughts. Quite simply we are not in the business of predicting what the markets will do… or at least we shouldn’t be. Trying to guess an outcome of the election and in turn trying to predict how the market will react to that outcome is gambling plan and simple. Personally I like to trade from the higher time frame charts and I am just going to keep an eye on how price reacts to the election and carry on with my trading plan as usual. Plan your trade, trade your plan. If your system provides you with a signal based on your trading plan as a result of the volatility created by the election, great. Hello all fellow forex traders I hope you are having a wonderful and restful weekend. I am sitting in my office this afternoon watching the beautiful sight of the last few remaining leaves on the trees fluttering in the wind and falling to the ground, wondering at the same time where the summer went. While I am marvelling at the beauty outside my window I am also analyzing my charts, highlighting any potential upcoming trading opportunities, and planning my week. I thought I would share my thoughts on Gbpusd and EurGbp for what it is worth. You will see that I have several moving averages on my chart and I also use heiken ashi candles versus regular candles. To be clear I do not really use these moving averages to make my trading decisions but they are a useful tool in determining a trending versus a ranging market. I have been following the work of Greek forex trader Nikos Mermigas lately and I really like the way he does his top down approach and uses these moving averages to offer some guidance but not to make his actual trading decisions. I would highly recommend that you do a search on YouTube for Nikos Mermigas’s videos, they are fantastic. The brown line is a 633 ema, the white line is a 200 ema, the blue is a 36 ema, and the blue is a 12 ema. The brown and white ema indicators are simply on the chart because they do tend to act as dynamic support and resistance when viewed on the weekly or daily chart. These longer terms emas can be useful if price is in a trend and retracing to a known support or resistance level and at the same time butting up against one of these strong dynamic support or resistance levels. This type of confluence in the market can lead to a very high probability trade set up. The red ema is basically the trend ema and if showing a nice downward or upward slope it is a great quick visual marker that price is trending and not ranging. Drawing the trend-lines is still key however. The blue ema is what Mr. Mermigas refers to as the volatility line and is useful to determine the strength of the trend. If there is quite a bit of space between price and the volatility line as price flows to and fro in the direction of the trend it is an indication of a strong trend. In a strong trend price will often continually bounce off of the volatility line. The heiken ashi are really great for visually cutting out some of the noise and showing the observer when there is a legitimate change in market sentiment from long to short or vice versa. Now lets get to the analysis. Looking at the weekly GbpUsd anyone can tell we are in a strong down trend and have been for many weeks. Drawing your support and resistance lines (in yellow on my chart) on the weekly chart is also a great thing to do because those areas will be of great significance. Currently you can see price is in a bit of a consolidation and is actually retracing higher back up toward the volatility (blue) and trend (red) lines. Really what we would like to see is a move back up to at least the blue volatility line. Even better yet a retrace back to the red trend line. If such a retrace also happens to coincide with a known resistance level this can be a very powerful location for a high probability trade set up. Once we have a red closed daily heiken ashi candle after a nice retrace we may want to consider a trade in the direction of the downward trend. Again I have to stress this is a much more risky trade plan then basing your trading decisions from the Daily Chart because there is greater chance that you will be getting into the trade in the direction of the overall trend but at the beginning of a larger retrace. However, using the H4 chart does offer more potential opportunities to get into the overall trend move. I have avoided drawing too many lines to keep the chart as clean as possible but essentially what the 1-2-3 entry method entails is watching for a retrace on the chart and taking a trade on the break of the retrace trend-line (aqua line). You would want to wait for a forceful break with a great deal of volatility and this is usually going to occur during the London session, U.S. session or London-US crossover session. You can also use the 1-2-3 entry technique from the daily chart after the nice large retrace discussed above. You will typically want to place your stop above the last swing high (or swing low) with at least a 10 – 15 pip buffer above (or below) the swing high (or swing low). Well I hope that this post has been somewhat helpful, and if so please comment, like and share :). Again be sure to check out Nikos Mermigas on YouTube as his material is great and has been very helpful for me. Again, as always this post is not to be taking as trading advice of any kind and is for informational purposes only. Hello all, I hope that 2016 is treating you well so far. My wife and I were blessed with the birth of our daughter last May and she has been keeping us very busy :). So busy in fact I have not had a chance to write anything on my blog in quite a long time. It is a bit of a lazy Sunday afternoon in our home today so I have seized the moment. I have really been giving a lot of thought lately to why so many forex traders are unsuccessful over the long term, and what is the key thing that separates a long term consistent trader from those that crash and burn and blow up their account in less than a year? Having been involved with forex in some degree or another since about 2005, I can say from experience that for a very long time I was very focused on finding that “holy grail” strategy. “If I could only find that perfect trading system that gives me laser accurate entry signals I would be successful” I would think. And so I would go jumping from one trading system to another on the forex system treadmill. Does this sound familiar to some of you? Perhaps there are a lucky few who skip this initial search for the “holy grail system” phase in their trading journey but I have a feeling this is a very very common phenomenon. Eventually after getting tired of being on this “forex system treadmill”, and after much self reflection I eventually came to the conclusion that a trader’s “system” which tells them when to enter and exit a particular trade is actually a very small part of what makes a trader successful over the long term. We spend so much time focusing on this, and marketers are so successful selling us “trading systems” but what most of us actually fail to realize is that having a sound trading system is only a good start. Why am I entering this trade (why do I feel I have an edge here)? Where am I going to set my stop loss to get out of the trade if I am wrong? How much risk am I going to take on this trade and thus what lot size am I going to take on this trade? If the trade goes in my direction am I going to move my stop loss to break even, or move it higher than that to lock in some profit? At what point am I going to move to break even or lock in profit? Where am I going to bank my profit and get out of this trade? If you start thinking about all of these questions after you have already entered the trade its too late. You are no longer going to be objective about your trading decisions at that point. This is not to say that you should never alter your trading plan once the trade is open if something unexpected occurs, but I believe that we so influenced by our emotions once a trade is open and we have money on the line that these decision have to be made prior to entering a trade. Plan your trade and trade your plan. In addition our failure to truly follow a trading plan, we as forex traders tend to use way way too much leverage and take on way too much risk. It wasn’t that long ago that I personally believed I was being conservative by only risking 2% – 3% of my trading capital per trade. Not only would I risk 2% – 3% per trade but I would sometimes take multiple positions at the same time on currency pairs that were highly correlated. For example GBPUSD and GPBJPY. In effect I wasn’t actually risking 2%-3% of my trading capital but more like 6% – 9% if I had 2 or 3 positions open. This is a recipe for disaster. Only you can really ascertain what amount or risk is right for you, taking into consideration your trading style, your risk appetite and your trading objectives. However, I believe large draw downs are probably the number one reason traders assume their trading system is no good and abandon it prematurely and move on searching for the next “holy grail”. When in fact their trading system was fine, they were just taking on way too much risk per trade. Psychologically it is so difficult to sit through a period of large draw down. Every trading system loses; period. In fact it is possible for your trading system to suffer, 5, 10, 15 or more consecutive loses before turning around. Will you be able to stomach a draw down of 30%, 40%, or 50% or more while maintaining the confidence that your trading system is solid long term and will bounce back? Much easier said then done. The good news there a way to drastically reduce the draw down your trading system suffers and reduce the likely hood that you will blow your account or abandon an otherwise solid trading system. Reduce your risk!! Personally I have come to the decision that I am not willing to go through any more than a draw down of 25% on my account. Any more than this is outside of my comfort zone. How am I going to prevent a draw down of any more than 25%? Well, there are never any guarantees but I believe that if I use an absolute maximum risk of 1% of my trading account per trade and do not take multiple positions simultaneously on highly correlated pairs this should give me a very good shot at preventing a large draw down. I wanted to spend some time today writing about a great new trading course / trading group that I was fortunate enough to join last month, which I believe has really helped my trading thus far. It is called “Inventory Trading” and was developed by Mr. Shonn Campbell. Mr. Campbell takes a very fresh and unique prospective on his forex trading. In a nutshell Mr. Campbell approaches his forex trading business as any retail inventory manager would deal with their physical inventory. For example just like physical inventory in the retail business, in forex you are avoiding, at all costs, taking on inventory that you cannot unload later at a better price. Also just as a retail inventory manager you are always looking to pick up more inventory when it is on sale. I personally found this perspective on forex trading very intriguing and it has really helped me look at my forex trading in a different light. Without giving too much more away I also love the inventory trading course because it focuses on trading with the trends, primarily using the 4 hour charts. This type of trading definitely matches my personal preferences. Mr. Campbell’s Inventory trading course includes hours of instructional video content with real chart examples and is very reasonably priced at a one time cost of $27. I have included the link below to provide some more information on the Inventory trading course. I would like to stress that this is not an affiliate link and I have no financial incentive for promoting this course. I truly believe that the Inventory Trading Course will help many of you take your trading to the next level and as such I just wanted to share this with you. Prior to offering the Forex Inventory Trading course online Shonn Campbell authored the ebook “Inventory Trading: How I run My Trading Account Like a Retail Inventory Manager”. As a special gift to you and to give you a bit of a taste of what the Inventory Trading Course has to offer, Mr. Campbell was kind enough to allow me to provide to you his ebook free of charge which can be downloaded by clicking the link below. Again I would definitely encourage you to check out Shonn Campbell’s Forex Inventory Trading Course as there it offers tremendous value for the $27 he is charging. Well I hope you have enjoyed this post and if you have I would kindly ask that you comment, like and share 🙂 Until next time I hope you have some profitable forex trades! First of all I would like to wish you all a happy and healthy new year, and I hope that 2015 is also a profitable trading year for you all. Several months back I provided a review of a forex trading tool that I have become quite fond of and continue to use very regularly known as Andrew’s Forex System. As explained in part I of my Andrew’s Forex review (click here to view Part I) this system is a very simple tool which helps one determine which forex pairs are currently trending, and allows one to enter a trade at a “sweet spot” in the direction of the trend. Andrew’s Forex System is designed to be traded from the 4 hour charts, which by the way is my personal favorite time frame to trade, so the system was a great fit for me. I have to say that the more experience I gain trading forex and the more I work on developing my skills the more I truly believe that trading with the trend is the way to make it in this business. If you can find a simple strategy that allows you to put the odds in your favor by trading with the longer term trend you will be miles ahead of most. As you can see from the chart above the AudNzd has been in a nice bearish trend. On December 4th and again on December 9th the system triggered a short trade. I personally like to put my stop 5-10 pips above the recent swing high level. Assuming the trade goes as planned once the trade is at a 1:1 risk vs reward level I move my stop to break even. At this point the trade becomes a risk free trade which is a very nice spot to be in as a trader. I set my take profit level to the 1:2 risk vs reward level so that I am always aiming to gain twice as many pips from the trade as I am risking. As you can see from the chart above the trade did end up reaching the 1:2 risk vs. reward level. Putting the odds in your favor by trading only in the direction of the trend, and ensuring that your winning trades are larger than your losing trades is a deadly combination and has been working quite nicely for me. So today I am going to continue where we left off last post. As I was saying, I truly believe the more you can strip down and simplify your trading the more success you will ultimately find. In my humble opinion I would also say that watching previous support and resistance levels or zones on the higher time frames (4 Hour / Daily) to see how price reacts at those levels can be an extremely powerful and simple strategy when it comes to forex trading. In my last post I expressed that price can really only do one of three things when it reaches these levels if you think about it. 1. It can push through and keep on going, 2. It can bounce and reverse back the other way, or 3. It can stall out and consolidate for a while (sideways) before continuing in the same direction or reversing. Take a look at the chart below which shows the UsdChf currency pair from last week on the 4 Hour chart. The 4 Hour chart is my personal favorite to trade from. As you can see from the chart above I mark support and resistance levels (ie. bounces). Once the recent support and resistance levels are marked out you simply wait until price approaches one of the levels. I usually check my charts twice per day for potential trading opportunities, (once in the morning and once in the evening), which is usually often enough if you are working from the 4 Hour chart. As you can see from the chart above the UsdChf has been in a bit of an uptrend lately. There was a recent bounce (support) at about the 0.9135 level on August 26th before it kept going bullish. Price then retraced back toward this support level on August 28th. What did price do? As you can see price temporarily broke through the support level, but then quickly reversed with a nice bullish engulfing bar. What did this price action tell us? Well to me, this was a big clue that this support level was likely to hold, and price was likely to continue going bullish. What did price do next? Well it did pull back slightly toward the support level again, but then pushed nicely upwards about 45 pips toward a recent resistance level before the market closed for the weekend. At these key levels I am typically looking for one of several candle patterns as a clue that the level may hold. One is an engulfing bar that engulfs one or more of the previous bars, and is going in the opposite direction. This is what happened in the chart above. Another candle pattern to look out for is known as a “pin bar” or shooting star shown below. This candle pattern forms with a long tail and a small head. 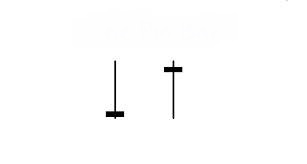 The pin bar on the left is what is known as a bearish pin bar, and the pin bar on the right is known as a bullish pin bar. A bearish pin bar may indicate that price may continue dropping (bearish) and a bullish pin bar may indicate that price may continue rising (bullish). Why this pattern is significant is that it also shows that price is moving in one direction, but then quickly rejects that level and moves in the opposite direction. The final pattern that I watch out for is basically the same as the pin bar, but instead of the reversal action happening during one candle it is spread out over two candles. 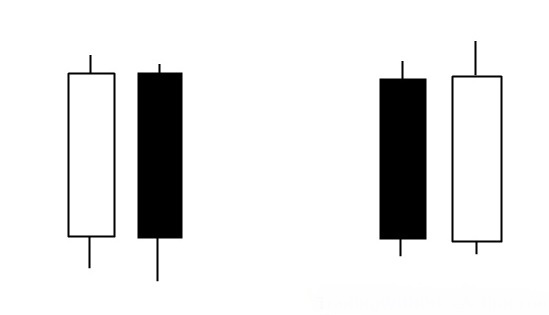 This is known as the ‘2 candle reversal” shown below. The 2 candle reversal patter on the left would be a bearish signal as price moved up but rejected the upper level and moved back down. The 2 candle reversal patter on the right would be a bullish signal as price moved down but rejected the lower level and moved back up. Just one more comment about the UsdChf above. Personally I usually only enter a trade if I can get a 1:2 risk vs reward from the trade. Most often you will need to wait for a bit of a pull back toward your support or resistance level before entering in order to get in at a good enough price. In my next post I will talk more about good ways to choose your stop loss and take profit values even before you enter the trade, so that you can get a 1:2 risk vs. reward if the trade is successful. I also believe that choosing your stop loss and take profit levels before you even enter the trade is very very important, because it takes much of the emotion, decision making and objectiveness out of the trade once you are in. Believe it or not, but your thinking and decision making process is at its clearest and most objective before you enter the trade and have money on the line. As soon as you are in the trade your objectivity goes down, and emotions such as fear and greed often begin to take over! Getting a handle on these emotions can be one of the most difficult aspects of trading. Well more on these issues in the next post. Hello all, I hope you are having a great summer! Summer is a time for enjoying the outdoors as much as possible, which I have also been trying to take full advantage of before another winter sets in. But now that we are getting closer to fall time, and getting closer to increased volatility in the forex markets as summer comes to end, my attention is turning back to forex trading again. I just wanted to write a little today about what I believe makes a profitable forex trading plan. Like most things in life I truly believe that the more simple you can keep your trading plan the more profitable you will be. I think we all have this instinctive idea in our minds, either consciously or subconsciously, that a forex trading plan needs to be complex in order to be profitable. However, I personally believe the opposite to be true. 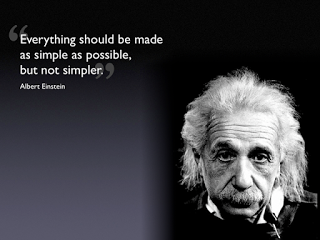 In my humble opinion the more you can simplify your approach to trading the more success you will find. In this blog post I am going to intentionally over simplify things but I plan to get into more detail in my posts to follow. If you have been following my blog for any length of time you will know that I am a strong believer in trading with clean charts on the higher time frames. What do I mean by clean charts? I mean using very few, if any, indicators, and relying on price alone for clues as to what a particular currency pair may do next. By saying that I rely on price, what I mean is that I am primarily looking at support and resistance levels, and what price is doing at those levels. As price approaches these historic support and resistance levels we should be getting ready to observe the valuable clues that the market is offering. Price can really only do one of three things once it reaches a key support or resistance level: 1) break through and keep on going, 2) reject the level and reverse in the opposite direction, or 3) stall or consolidate at that level for some time before moving in either direction. In my next post I will discuss a little more about the type of candle pattern formations that often occur at these key support and resistance levels, and if carefully observed will provide high probability trading opportunities. Have a great day and stay tuned for the next post!